Reads your Altitude Encoder and displays your current altitude as seen by ATC. Display indicates when your current altitude is above or below your Programmed Assigned Altitude. 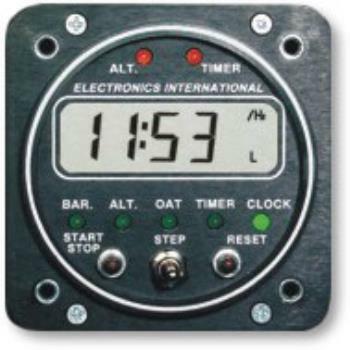 Displays Density Altitude based on your current OAT reading and may be toggled between degrees F and degrees C. A Programmable Timer may be set as an "UP" or "Down" counting timer. The "UP" Timer will start automatically when your current altitude reaches 300 feet above the ground. A Recurring Alarm may be set to alert you at appropriate time intervals. 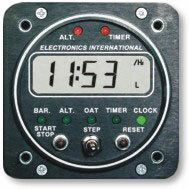 This alarm can be used to remind you to check your fuel level, engine instruments, course, etc., at set time intervals. The "Down" Timer may be used to time approaches or turns or as a reminder at a set interval. The "UP" Timer will continue to run in the background when the "Down" Timer is selected. Operates from 7.5 to 35 volts at .3 amps.